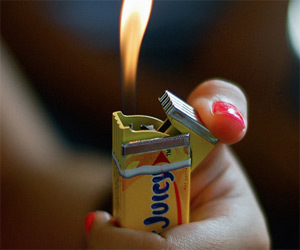 But how do these Pack o' Gum Lighters circumvent copyright issues, you ask? Or probably you could care less. I wouldn't care either, except that I happened to notice that Extra Gum has been mysteriously recoined Exrat. Which sounds like rodent poison, and not something I would even want to light my newly-legalized joints with, much less chew for extra long flavor. And in the spirit of the romance language's grammatical convention of placing adjectives after nouns, Juicy Fruit has become Fruit Juicy. 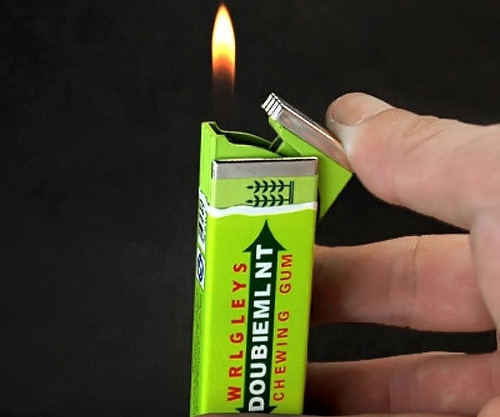 But perhaps most bafflingly, Wrigley's Doublemint gum has been rebranded Wrlgley's Doubiemlnt. WRLGLEY'S DOUBIEMLNT! Those aren't even pronounceable words! They make me question the ability of whomever approved them to make and sell a device that can safely generate and harness one of Mother Nature's most unwieldy elements. I don't know. 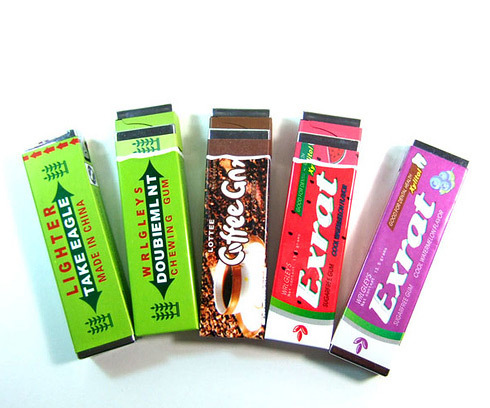 Maybe these gum lighters were intended to be studied and analyzed only post- instead of pre-smoking endeavors. Maybe they develop a profound meaning and speak great Truths then. Maybe I'll go test that theory out and get back to you.